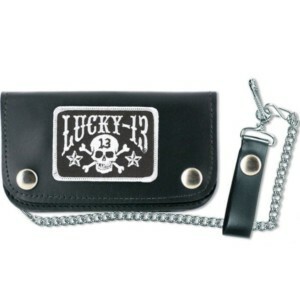 The SKULL STARS wallet is a 6" genuine leather wallet with chain, leather clasp, and a fully embroidered patch of our "SKULL STARS" design. 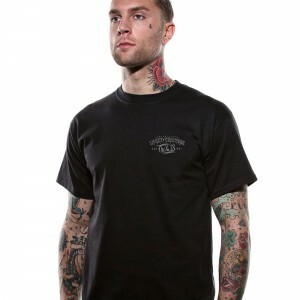 The ACE OF SPADES short sleeve men's tee. 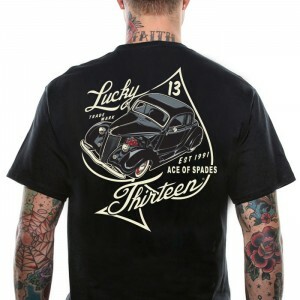 There is a full back screen print of the Lucky 13 "Ace Of Spades" graphic and a front left chest print to match. 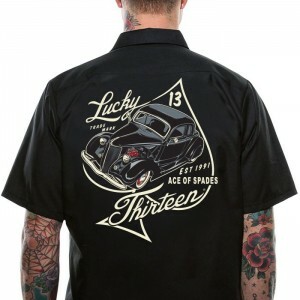 The ACE OF SPADES short sleeve work shirt "Lucky 13" embroidery on front. 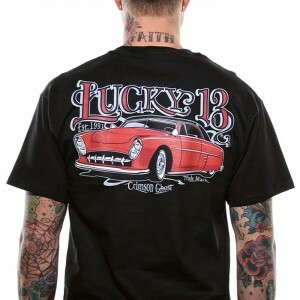 The back is printed with the Lucky 13 "Ace Of Spades" hot rod design. 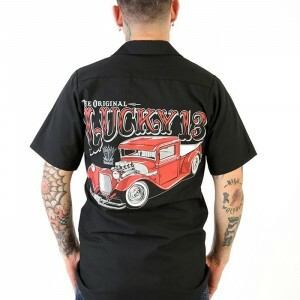 The American Original men's work shirt by Lucky-13 Apparel. 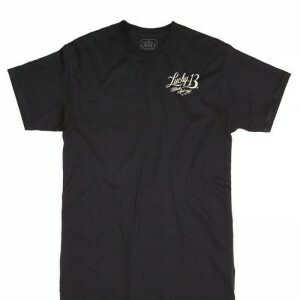 There is a full back print of the "BLACK & TAN" logo, with a front left chest print to match as well. "Crimson Ghost" short sleeve men's tee There is a full back print of the "Crimson Ghost" logo, and also a front left chest print as well. 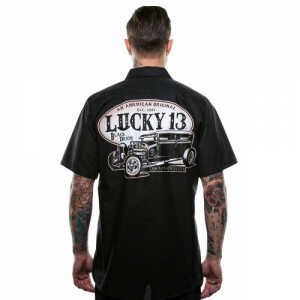 The DRAGGER Men's short sleeve work shirt with a "Lucky 13" embroidery on front. 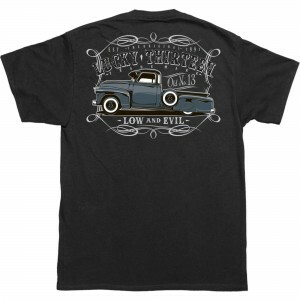 The back is printed with the "Dragger" classic pick up truck design. 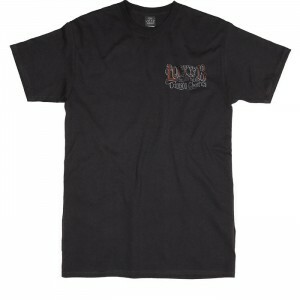 The DRAGGER short sleeve men's tee. 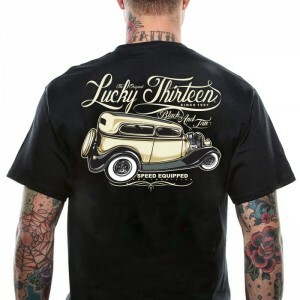 There is a full back print of the "Dragger" graphic of a classic pick up truck and pinstriping detail, and a front left chest print as well. The Floorless short sleeve men's work shirt. 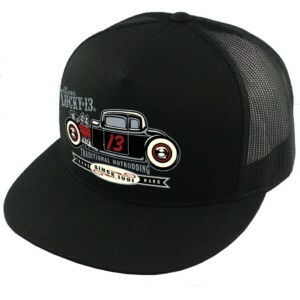 Back screen print logo of CHOPIT KUSTOM'S world famous "Floorless" custom Ford pick up. 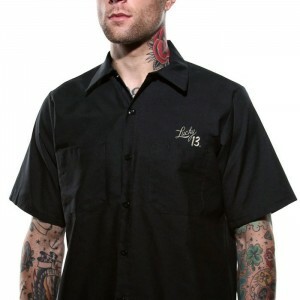 There is also a front left chest embroidery finishing off this cool work shirt. 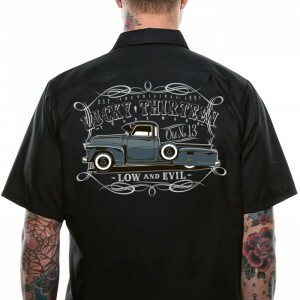 The LOLA Men's short sleeve work shirt is a cotton/poly-blend fabric. 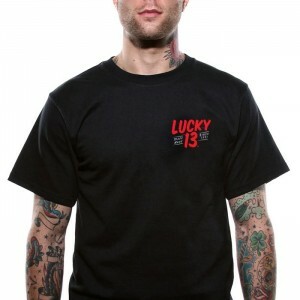 "Lucky 13" embroidery on the front. The back is printed with the "Lola" pinup girl design. The LOLA short sleeve men's tee is 100% soft-spun cotton tee. There is a full back print of the "Lola" pinup girl design.